Whether you’re working in a private or industrial workshop, there’s no doubt that your space will be filled with a variety of different machinery related to your preferred industry. You may have a band saw, milling machine, or a variety of other metalworking tools that require consistent lubrication and upkeep. 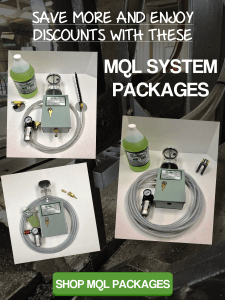 Failing to perform the proper maintenance on your equipment can result in lower-quality production and workplace accidents, which is why it’s so important that you invest in a high quality minimum quantity lubrication system. If you haven’t put much emphasis on regular lubrication in the past, there are a variety of important reasons as to why you should get in the habit of consistent maintenance. A band saw, for example, that’s unable to produce accurate cuts isn’t of much use in the long run. By providing your equipment with consistent lubrication, you can ensure that it produces smooth, accurate cuts without any issues or hassle. When searching for a suitable lubricant, you can’t go wrong with the minimum quantity lubrication system we offer at MagLube.com. As one of the leading eco-friendly industrial lubricant manufacturers, we pride ourselves on creating sustainable lubricants that allow machinery to operate at top performance, minimizing wasted materials and equipment related accidents. Lubrication plays a vital role in reducing the friction created by the movement of heavy machinery. A minimum quantity lubrication system works to reduce heat and respectively lower the chances of your equipment overheating. By allowing your equipment to work so hard it begins to overheat, you not only put extra strain on the tools and risk long-term damage, but it cuts down your productivity as you’ll need to take the time to let your machinery cool off before you can continue working again. With regular application of the industrial lubricants from MagLube, you’ll never have to worry about damaging your equipment as you work hard throughout the day. Regular lubrication through a minimum quantity lubrication system can save workshop owners a fair amount of money in the long run. Infrequently lubricated equipment generally has a much shorter life-span than those that are maintained properly. Poor maintenance can also facilitate the need for costly repairs and expensive replacements. A little bit of consistent maintenance can go a long way in extending the life and improving the functionality of your manufacturing equipment. With a minimum quantity lubrication system from MagLube.com, you’ll be able to work efficiently while reducing workplace errors and imperfections.